It’s not a good sign when an umpire’s batting average is a topic of discussion in the MLB postseason. 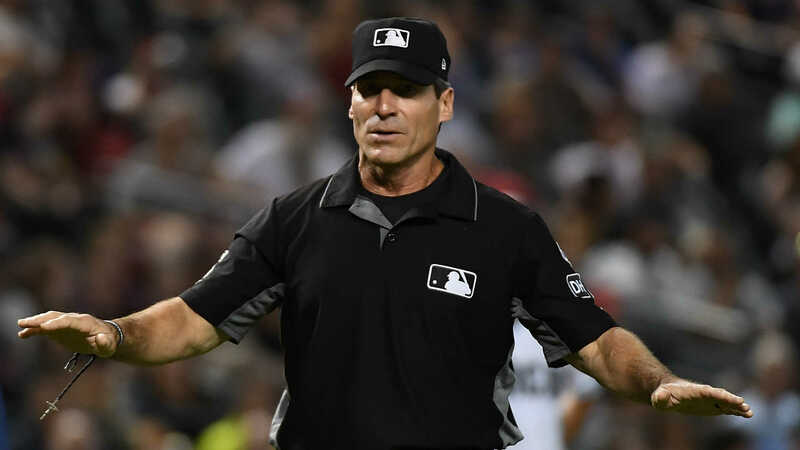 But it was Monday night when veteran Angel Hernandez went 1-for-4 on replay reviews in the Red Sox’s 16-1 ALDS Game 3 victory over the Yankees. Imagine if it had been a close game. Imagine if, as it appeared might’ve been the case, Hernandez, 57, had gone oh-fer. The one reviewed call that wasn’t overturned looked as if it could’ve been but wasn’t conclusive. Even so, former major-leaguers took notice — and to Twitter. Yanks can score 10 more and win in an all time come back and this will still forever be the ‘Angel Hernandez game’ for me. — Bottom of 2, Hernandez called Didi Gregorius safe on a bunt that would’ve put Yankees at first and second with none out in a 1-0 game, but the call was overturned and New York didn’t score. [email protected] challenge call that Didi Gregorius is safe at 1B in the 2nd; call overturned, runner is out. — Bottom of 3, Hernandez called Gleyber Torres out on an infield grounder, but replay showed he was safe. The Yankees couldn’t move Torres around. [email protected] challenge call that Gleyber Torres is out at 1B in the 3rd; call overturned, runner is safe. — Bottom of 4, Hernandez called Luke Voit safe on an infield single off pitcher Red Sox pitcher Nathan Eovaldi’s glove. Boston challenged, and the call was upheld. — Still bottom 4, Hernandez later in the inning called Gregorius out on a 4-6-3 double-play, but after review he was ruled safe for an RBI fielder’s choice for what ended up being the Yankees’ only run. Some context (via ESPN.com): Over the past three regular seasons, 14 of 18 of Hernandez’s calls at first base that have gone to review have been overturned. That’s a 78 percent overturn percentage. The overturn rate among all umpires is 60 percent. More context to make things even more intriguing: Hernandez, a frequent target of dugout displeasure, will be behind the plate for Tuesday’s Game 4. According to ESPN Stats & Information, his correct-call rate on balls and strikes is 91 percent, ranking 35th of 89 umpires this season. Not awful, but … this is the postseason, as Lo Duca noted.